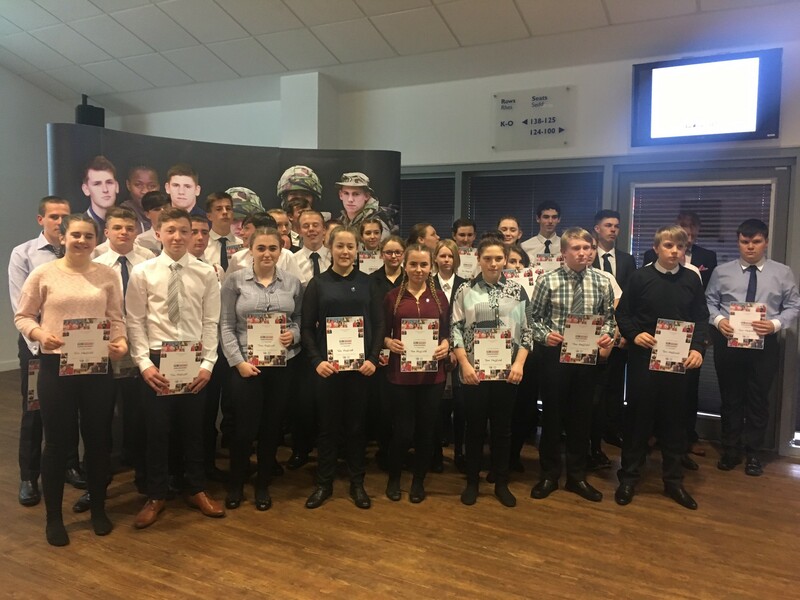 Students from three centres in Bridgend, Cardiff and Rhymney had the opportunity to showcase the skills learned at the free-to-attend specialist schools, which provide 14-16 year olds in Wales an insight into life within the Armed Forces and other Public Services such as the Fire Service. Around 280 guests attended the special ceremony on Friday 17th March, including family members, VIPs and Olympian Tom Haffield. A series of demonstrations, including physical training exercises, footdrills and log displays were performed for the audience, followed by a formal presentation of special achievement awards to the teenagers. Awards were presented for Most Improved learners, Best Academic performance, Best Turnout, Physical Training and Learner of the Year. A number of students also spoke publicly about the personal impact that attending the unique Military Preparation School has had on their lives. The Military Preparation Schools network is overseen by the Motivational Preparation College for Training (MPCT), a Cardiff-headquartered organisation that recently received the prestigious ‘Training Provider of the Year’ honour from the Times Education Supplement Further Education awards. Committed to engaging young people and preparing them for training, further education and employment, the Military Preparation Schools actively support and complement all local school curricula and provide engaging, practical activities to equip learners for post-16 and higher education. The ceremony was attended by Olympic swimmer Tom Haffield, who is part of the Sky Sports initiative ‘Living for Sport’. The free initiative is open to UK & Ireland secondary schools and alternative educational providers. It uses sport star mentors to inspire young people, while following a ‘Six Keys to Success’ plan that helps to build confidence and teach valuable life skills, that will help learners both in and out of school. Mr Haffield has previously visited the Bridgend, Cardiff and Rhymney Military Preparation Schools to run a mentoring session with learners. By attending Friday’s ceremony, Mr Haffield further showed his support for what the schools programme does and the valuable skills it teaches young people. The Military Preparation School’s vocational-based curriculum offers a diverse learning experience for learners, providing the opportunity to gain Public Services certification in either Teamwork and Personal Development or Employability Skills. The curriculum complements existing mainstream education, while also supporting learning for those who have struggled with engagement and motivation within a traditional classroom environment. To find out more about the Military Preparation Schools provision, visit www.mpct.co.uk or call 08442 438438.